Get ready to tear up the highway with the Bandit (Burt Reynolds), a fun-loving, fast-talking trucker who takes on his craziest haul yet - delivering 400 cases of beer from Texarkana to Atlanta in just 28 hours. 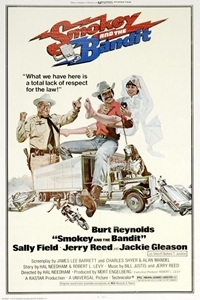 With Sheriff Buford T. Justice (Jackie Gleason) hot on his trail and eager to teach him some respect for the law, the Bandit joins forces with good ol' boy, Cledus (Jerry Reed) and runaway bride Carrie (Sally Field). Gear up for huge laughs, pedal-to-the-metal action, and some of the wildest car crashes ever filmed!